This quick and easy supper can be on the table in less than 20 minutes. Packed full of flavour, it's a definite family favourite. 1. Place the butterflied chicken fillets on a layer of parchment paper and cover them with a second piece of paper. Using a rolling pin, flatten the fillets until they are 3mm to 4mm thick. Remove the top layer of parchment paper and season the chicken with the lemon zest and some salt and pepper. Set aside for a few minutes. 2. Combine the grated cheese, red onion, tomato, chilli, spring onions and basil in a bowl. Season lightly with a little salt and pepper. 3. Heat a griddle pan over a medium heat, then add the bacon and cook for 2 minutes, until crispy. Transfer the bacon to a plate lined with kitchen paper to absorb any excess grease. 4. Add the chicken fillets to the pan and cook for 3 minutes, until cooked through (the chicken cooks very quickly because it has been flattened so thinly). Season well, then transfer the chicken to a cutting board and slice into thin strips. Dice the bacon into small pieces too. 5. 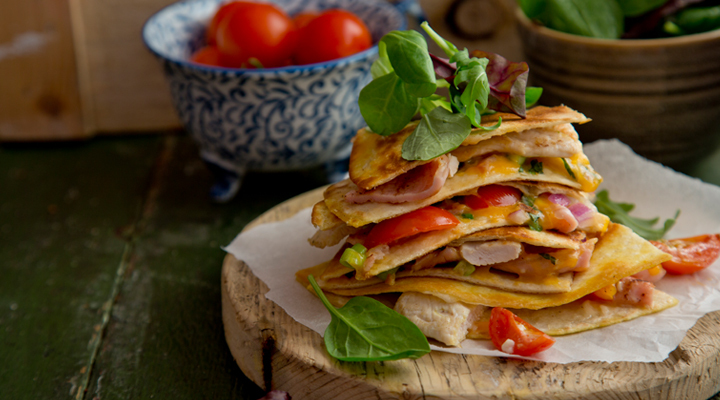 Spread a little mayonnaise on a flour tortilla, then top with a quarter of the chicken, bacon and the cheese and tomato mixture. Place another tortilla on top to make a sort of sandwich. 6. Heat a frying pan with a drizzle of oil and place the quesadilla in the pan. Fry the quesadilla for 2 to 3 minutes, until the bottom is golden brown. Use a plate to help you flip the quesadilla over, then return it to the pan and cook for a few minutes more, until the cheese has melted. Repeat with the remaining tortillas and filling to make 4 quesadillas in total. 7. Combine the salad leaves, cherry tomatoes, olive oil and lime juice in a bowl and season with salt and pepper. 8. Cut the quesadillas into quarters and serve with the salad on the side.